It was my birthday last week. I’m not happy about it. At the very least, however, birthdays are a good excuse to get out of the house and actually do something with other human beings, and this can be a nice welcome change. This year, I decided I would treat myself to watching the brand new wide release from the wonderful A24 – the same company behind a good chunk of my favourite films of the last decade. Namely, I went and dragged a pair of mates along to watch the horror on everyone’s lips and underwear stains, Hereditary (2018), a film rightly held up by the Washington Post as the scariest film of the summer – and maybe ever! The interesting thing? All three of us had a widely different experience – and for the same reasons. Let’s see if we can work out why. Written and directed by Ari Aster, Hereditary opens on a wealthy family in a giant house somewhere in America, Hereditary introduces us to a family in mourning. Well. A rough approximation of it, anyway. At the funeral of her mother, Annie Graham (Toni Collette) is joined by her husband Steve (Gabriel Byrne), son Peter (Alex Wolff) and, finally, her daughter Charlie (Milly Shapiro). The overall impression is that Annie’s mother, Ellen, was a controlling and manipulative influence in the family – having moved into Annie and Steve’s home for the last few months of her life. She took a particular interest in Charlie, going so far as to treat her as her own child – even down to the, uh, the feeding of her as a baby. If that image isn’t enough to set the tone of the piece, then I’m not sure what would. Despite the distress of her grandmother passing away, Charlie was clearly treated… differently. Through tears, she complains to Annie how grandma wanted her “to be a boy,” as well as several other troubling clues as to her care of Charlie. With her gone, however, the focus of the family turns to Annie. Unusually calm about the situation, Annie often confines herself to her studio where she continues to work on her miniature art pieces, prior to the launch of her art gallery debut. Unable to focus, Annie excuse herself from the home, heading out to a grief counselling session to unload the horrible truth of her mother’s care and mental health issues that have torn through her family in one way or another. Later, we see more of Charlie’s odd behaviour. From drawing disturbing images in her book, to piecing together some truly creepy models of her own, even going so far as to take a pair of scissors to the throat of a dead bird, saving the head for later while she distantly chomps on a hopefully-nutfree bar of chocolate. She also showcases a particularly memorable habit of clicking her tongue in her mouth – so do remember dear readers, whether you’ve seen the movie or not, make sure to practice your click for the next person you see who has seen it. I can guarantee they will smile, pat you on the back and buy you a drink. Peter, meanwhile, lives the fairly standard life of a teenage boy. From mooching about in his room, to smoking pot with his buddies and crushing on the cute girl who sits in front of him in class. There is a distinct strain on his relationship with his mother, instead only really appearing to speak to his dad, who appears to treat him well enough. When Peter is invited to a party, he is obviously quite excited, but a suspicious Annie forces him to take his sister along for the ride – that way forcing him to remain sober. Charlie reluctantly agrees, and the pair shoot off to a world of teenage hijinx and adventure where nothing will ever go wrong. Go and ask for a piece of cake. And that, I’m afraid, is where I need to end the overview. The film descends into some extremely dark and raw places, driving the family to breaking point as the tension rises and escalates beyond expectation. Throughout, we see Annie retreat back into her work. You would be forgiven for thinking the miniatures are more important than they are, judging by the trailer, but it soon becomes clear that Annie uses this as a way to express and normalise the traumatic events happening around her. Indeed, a good solid chunk of the movie is a deeply intense family drama, where relationships are pushed to the limit. Indeed, at one moment in the film, Annie speaks her mind and, I kid ye not, the entire audience gasped. Gasped. I don’t think I’ve ever experienced the feeling of a group of people virtually leaning in with intrigue in that way over anything – the only comparable experience being as part of a play. A play might be a good comparison, actually. The flawless cinematography and direction mirrors Annie’s miniature art, with flat tracking shots passing through walls and following the action in the house in the same way an observer might run their gaze across the piece of art. This level of symmetry and simplicity lends the film a different sort of feeling, one that beckoned the audience in, rather than forcing their gaze on any one thing in particular. On the opposite end of the spectrum, it did mean some scenes felt like they really dragged – with long sequences of dialogue and minimal action which, yes, feels quite true to life, but at the same time playing against the audience’s expectation of movement. One thing’s for sure, Hereditary is a deeply uncomfortable watch. It is horror in the truest form. It felt like it had been lifted straight out of the 70s era of creepy, uncomfortable viewing, with some real Roman Polanski vibes throughout the film. The biggest takeaway for me was that horror really doesn’t need a man in a rubber suit. Nor does it require spooky special effects – and it definitely doesn’t need jump scares. In Hereditary, the most frightening thing is watching a family descend into a metaphorical hell. The most chilling scenes were little more than Peter sitting, staring into the middle distance. At one point, I had to remember to breathe. It. Is. Intense. The performances of Toni Collette and Alex Wolff, in particular, are beyond phenomenal. Toni, especially, showed a huge range across the film – with even some broad humour to her role, aided by some fascinating editing. I mentioned in my intro, that three of us went and had vastly different experiences. I can safely say that I fell deeply in love with Hereditary. It is horrible, it is savage, it is something truly unique. The performances and characters alone are something special, but the overall tone – and Colin Stetson’s atmospheric soundtrack – paint an unbelievable picture. I should also say that much of the imagery is hard to shift, too. Just thinking back over the film for this review, I find that I don’t need to refer to any other websites to check my facts – it’s all there. It’s all lodged in there. From sleepwalking sequences, to traumatising set pieces and eerie shapes in the corner of the room, the lingering shots let the picture wash over you – making you question exactly what is going to happen next. As for the others, well, one of them pretty much agreed with me, but was too afraid to compliment it. Indeed, he was on his phone almost immediately, phoning and texting people not to watch it. This guy was suffering, and I’m pretty certain spent most of the film behind either his hand or his shirt. The final friend, on the other hand, left disappointed. While he loved the first half, the second half stretched on and ended up somewhere completely different to what he expected – and sort of hated it for that. I take his point, but the depth of detail from the very first shot is enough for me to look past it. It’s a journey. The sort of one you wish you slept through, though I found the spirtualistic side of the story did feel a little hamfisted, it was enough to keep things interesting. 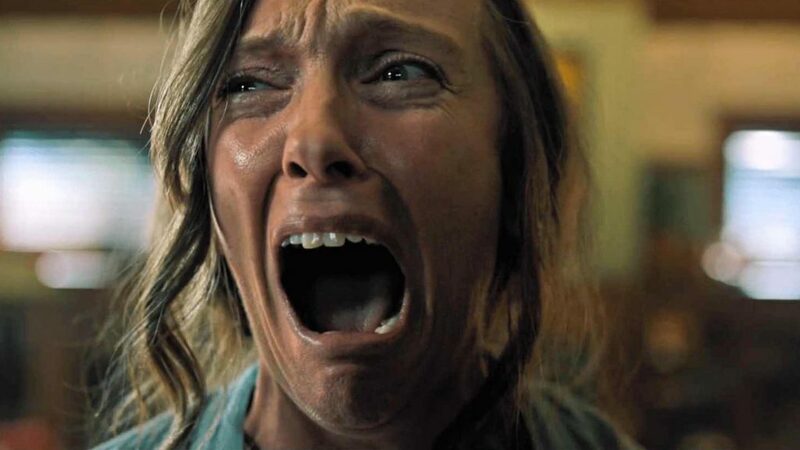 I don’t want to spoil anything if I can help it, but if you are at all interested in horror – you must see Hereditary in the cinema while you can. I can promise you that you will never experience a film like it. Well. I guess you could watch The Witch (2015).